Her customers choose from a mix and match lifestyle collection. Her designer collection comes in all sizes and are also available in a wide range of fabrics and colours of choice. “I have watched so many customers over the years become transformed as they discover clothes that makes them feel attractive and enhances their silhouette. They learn to love how they look! The key is stream-lining the body with sculpted well-constructed, understated garments to provide the proper fit and balance! This coupled with quality fabrics, attention to detail and the use of exquisite trimmings results in the creation of beautiful, elegant clothing”. Maire’s clients choose from an exclusive range of luxury fabrics which are available in a wide range of fabrics and colours. She meets with her clients at her studio in Dublin for an initial consultation. At this consultation she discusses the shapes, styles and fabric choice which best suits the client’s particular requirements. Her customer try on different shapes and styles to identify the most flattering silhouette, structure and best fit for them. Once a final decision is made a personal pattern is the made for the client. One or two subsequent fittings follow before the garment is completed. The lead in time for an outfit to be completed is approximately six to eight weeks. This may vary however depending on the time of the year. 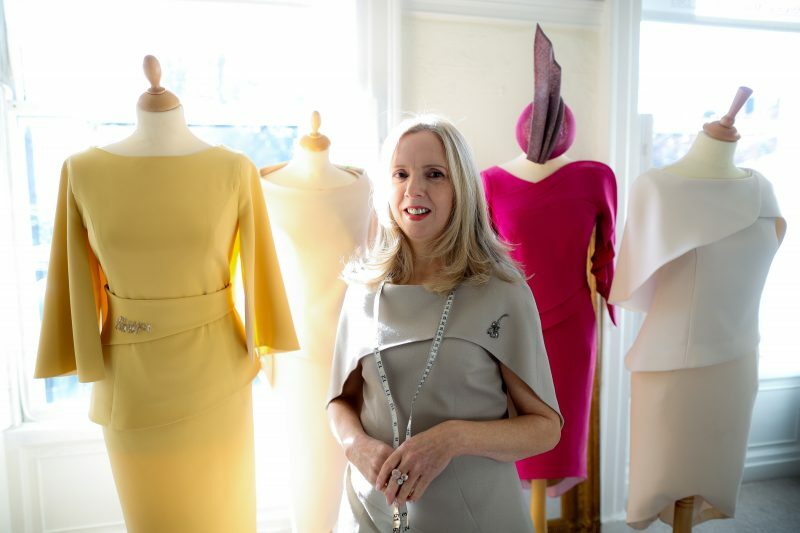 Maire has a wealth of experience as a Designer as Designer and Tailor to Couture Houses in Savile Row London and the high street multiples in the UK. She dresses ladies for royal events, international musical performances, the races, weddings and many other special occasions. Maire makes Mother of the Bride dresses and dresses for Black tie dresses. She also designs sculptured elegant couture wedding dresses for her customers.